Emily’s museum wedding with clean whites and muted linens and Samantha’s wedding with contrasting dark and light colors and a common string of sparkle were both held on the same date in May 2017. Compare elements of each wedding below and see if one speaks to you more! These two brides both chose a classic white gown with a sweetheart neckline. Emily (on the left) opted for lace details while Samantha (right) chose sparkle on top with a quieter tulle skirt. Emily’s bridesmaids wore soft mauve dresses, and Emily’s wore darker navy, each with pops of flowers in their bouquets to match. The groomsmen echoed this look with lighter versus darker ties and both grooms in white ties. Emily and Philip had their ceremony and reception in the same location, a clean modern museum. 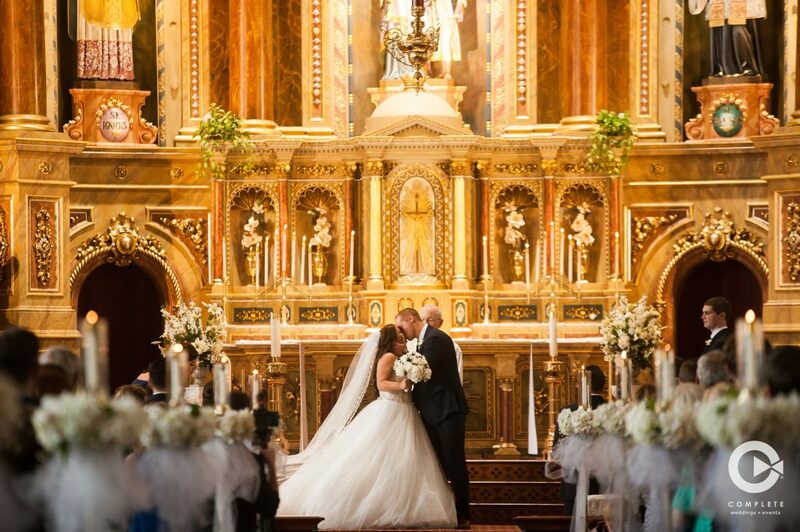 Samantha and Tony’s ceremony was at a grand church which provided an intricate beautiful background for their ceremony. They switched it up for their reception held at an urban venue where they added their own festive details! Seen to left are some of Emily’s soft pink and feminine touches. Samantha had navy details throughout giving a more masculine look with her own addition of sparkle tied in. No matter how you slice it, both these weddings looked elegant and gorgeous. They added just the right amount of flare to give personality to their venues and their overall day. Congrats to these two on their one year wedding anniversary this month!